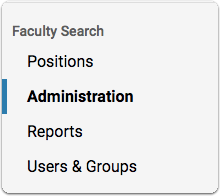 Committee Managers and Administrators can edit position settings and information from the Review Position screen in Interfolio Faculty Search. Click the name of any of the six steps listed in the "Edit Position..." sidebar to edit information and settings for the position. Click "view" to see published landing page for the position. Click "change" to unpublish landing page. 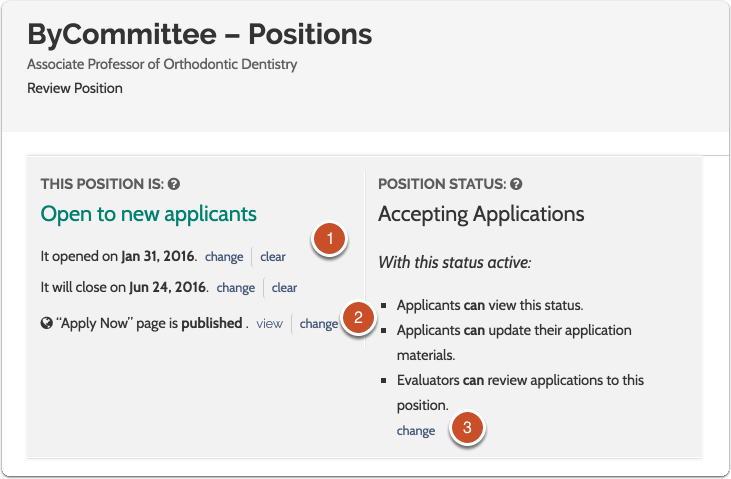 Click "change" to set status of a position and select associated permissions (e.g., allow Evaluators to review applications, allow applicants to update applications and/or view status). Note: While some areas are easy to change at any time, such as the members of the committee, we recommend exercising caution when editing other areas, particularly the required documents and application forms. Changes to required documents and forms initiated after the position opens may result in issues with the complete/incomplete status of individual applications.